Get your greens in with our tasty Sautéed Spinach Salad recipe. 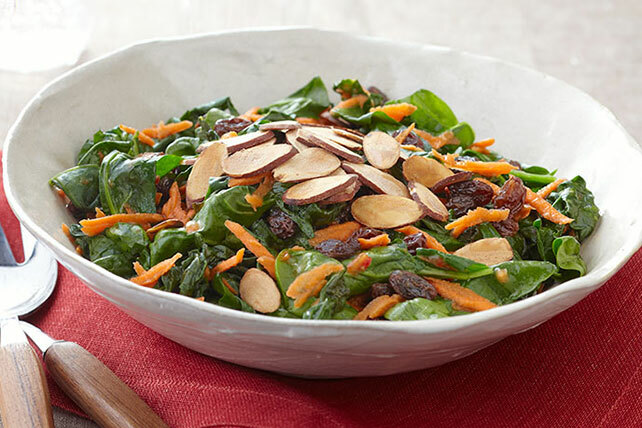 Including raisins, shredded carrots and sliced almonds tossed in a zesty Italian dressing, Sautéed Spinach Salad is big on flavor with minimal effort. It only takes 15 minutes to make Sautéed Spinach Salad! Bring dressing and raisins to boil in large saucepan. Add spinach; cover. Cook on medium heat 1 min. Add carrots. Turn spinach with tongs so unwilted spinach is on bottom of pan; cook, covered, 1 min. or just until all spinach is wilted. Spoon into bowl; top with nuts. Heat oven to 350°F. Spread almonds onto baking sheet. Bake 6 to 7 min. or until golden brown. Prepare using KRAFT Light Red Wine Vinaigrette Dressing and dried cranberries.